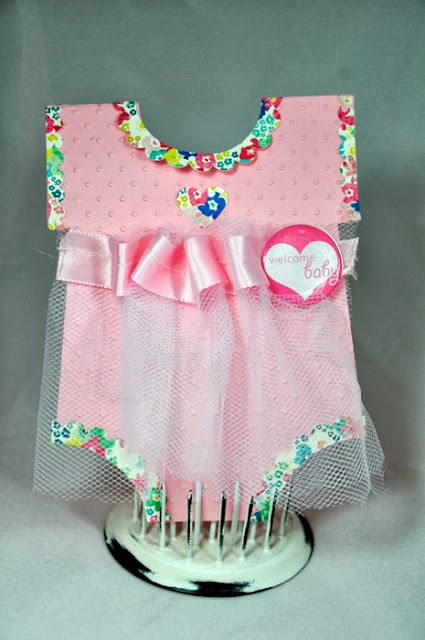 I made a fun little baby card this week for Epiphany Crafts. It never ceases to amaze me just how many ways you can utilize the Shape Studio Round 25 tool! I made a custom sentiment that says, "Welcome Baby" using the Round 25 punch and bubble cap. I cut the card base (A2 size) on the Silhouette Cameo. I used Maggie Holmes Crate Paper collection for the trim on the onsie. The ruffle was made by simply sewing a ribbon across the top of a piece of tulle which was approximately 12" long. I just added a strip of adhesive to my card base and gathered the ribbon as I attached it to create the cute ruffled look.